I like the idea of having a Bucket List. A list of things you want to do before you die. A list of things that are so extraordinary that you make an intentional plan to experience them. Now, I’m not here to debate the value or philosophy behind the Bucket List (not the movie, the actual list) and I’ve never really considered having one…until the other night. See, if I could have an alter-ego, I’d be like Sydney Bristow. If you don’t know who she is, she’s Jennifer Garner’s character from Alias–one of the greatest TV shows to ever air, in my humble opinion. Sydney Bristow appears to be the mild-mannered girl next door, but in reality, she’s a CIA super-spy. The closest I could get to that is the fact that Jennifer Garner and I share the same first name. However, the other night my hubby and I decided to watch a movie. 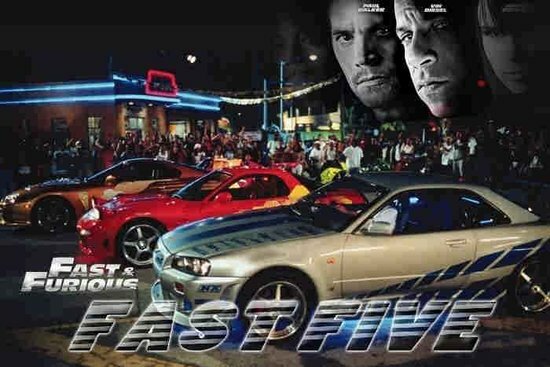 He chose Fast Five, the most recent in the series of Fast & Furious movies starring Paul Walker and Vin Diesel. I loved it. Every singe action-packed suped-up speeding cars second of it. So, I want to add driving a car to my Bucket List. I don’t want to drive a race car–no NASCAR or Formula 1 for me. Oh, no. I want to drive a suped-up street racing car like the ones in the movie–preferably one of the muscle cars like the Charger–and drive it like I stole it. With all the skills of a super-spy like Sydney Bristow. Yep, I’m adding that to the top of my Bucket List. Right after ‘Learn to Drive a 5-Speed’. Share with me: Do you have a Bucket List? If so, what’s the most insane item on it?? Oh my goodness, Jenny, I can tooootally see you behind the wheel of one of those cars! :)I have a bucket list too, and probably the craziest two things on there are traveling to all 7 continents (yes, even Antarctica…not sure how I'll make THAT one work) and going to all four of the tennis majors, preferably while I'm traveling the 7 continents to save some moolah. :)Have a great weekend! i dont think i've been intentional enough to say that i have a bucket list. usually something comes up as an opportunity, and i'm like, "i've ALWAYS wanted to do that!" anyway…happy friday! We must drinking the same Kool-Aid because on my blog today I mentioned a few items on my bucket list. So here's some more – speak a foreign language fluently, create a scholarship at my alma mater, and (like Sarah) visit every continent, but I'm OK if Antarctica gets skipped. That would leave only South America and Australia to go.Maybe I should add restore an old Mustang convertible?Blessings! I've wanted to make a written-down Bucket List forever! My husband and I talk about ours often. Hmm, the craziest thing on mine is probably skydiving, but I'm rethinking that one… my heart's not in it anymore. I don't have a formal Bucket List, but have done a number of things for the very first time after the age of 50! !Went down a zipline, climbed a rock wall, rode a horse (other than pony rides! ), got up on a wakeboard, geo-cached, sang karaoke, and got a book contract!!! !